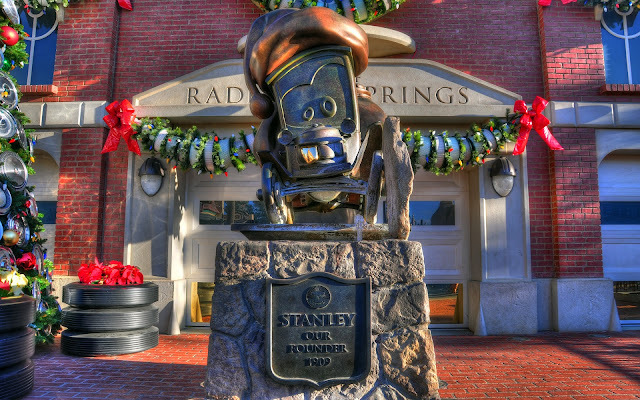 At the end of the main drag of Radiator Springs, right in front of the Courthouse, stands a status of Stanley, the good humored founder of Stanley's Oasis and Radiator Springs. The short film "Time Travel Mater" explores the origins of this most likeable character, and having seen it, I now understand and appreciate his charm even more deeply. During this Christmas season, Stanley has been engaged with the holiday spirit, and as a result, he and the Courthouse behind him have been dressed to the nines in Christmas finery. The air filter wreaths found all along the main street make their appearance on the building as well, and Stanley has been outfitted with a Santa sack--no doubt filled with radiator cap goodies for the good boys and girls who just need a Stanley cap! It's a wonderful transformation and one of many lovely details that form the "Carsmas" overlay. Stanley's statue in its "Stanley Claus" overlay. Stanley statue as a santa car with his Christmas tree and Santa hat and gift bag. At Carsland. One of my favorite pictures places right now! Thanks!! I love the way this is all set up! Nice post! I can't stop admiring the statue..Its fabulous! I love it there during Christmas!! Can't wait to go one year!! Very well crafted statue..It one step ahead than Oasis and Radiator..